Charisia Chatz is an installation artist and curator of contemporary art and design. Her creative artwork has also expanded into the art directing sector and her experience based on museums, galleries and art institutions have eventually created a strong character around her work and aesthetic. ! Having obtained a BA degree in Fine Art Sculpture at the University of Brighton, UK and an MA degree in Curating Contemporary Art & Design at Kingston University in partnership with the Design Museum, London, UK, she has also followed a short course in Video Arts Production at the UCA, UK. ! Her diverse work experience ranges from museums like the Benaki Museum and the Museum of Cycladic Art, to art institutions, such as the DESTE Foundation for Contemporary Art, the D.Daskalopoulos Collection, the NEON Organization, Athens, the Whitechapel Gallery, London, the International Festival of Digital Arts and New Media, and Absurdum Magazine, Athens. She has also participated as an installation artist, in projects like TEDxAUEB event, and in several shows in the UK. Furthermore, she has been involved in the creative aspect of short- ￼ film productions such as the film Austerity and the documentary of the art collector Alexander Iolas. Her enthusiasm in exploring new ideas and concepts around the arts, together with her eagerness regarding interaction with the audience itself, have contributed to a creative mind-set, rendering her prepared and inventive for this challenging field. ! 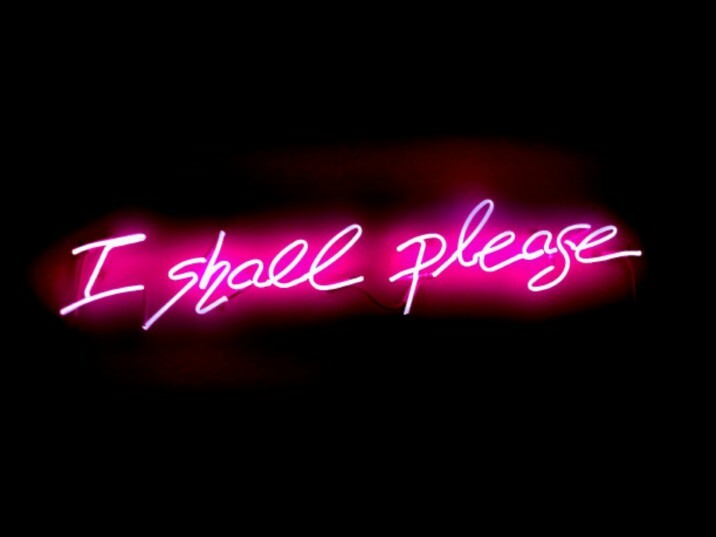 2015 Neon Lighting, 123 x 25 The word placēbō derives from the Late Latin phrase I shall please. The term placebo was first used in the late 18th century to describe any medi- cine adaptive to please rather than to benefit the patient. Placebo originated from Beecher’s observation of injured WWII soldiers believing to be injected with morphine when they were instead injected with saline solution. Their facial expressions showed relief from pain, and they behaved as if as in a trance. Today’s world is fixated on finding an escape from routine and while the pursuit of happiness is appeased by intoxication and satisfac- tion of the senses, it is ephemeral and thus happiness escapes us. A fundamental symptom of the 21st century is that people are becoming more materialistic than spiritual; they have distanced themselves from genuine satisfaction – which derives from the primitive connection of human beings with nature. A mishmash of facts, such as consumerism, technology and materialistic possessions have influenced our lives and subsequently this constant distraction has driven people into a situation of becoming absent in their own lives. It’s all in our mind – and if we fortify our minds with knowledge, wisdom and experience and establish essential communication with our inner self and the people around us, we won’t need to use any kind of substitute or else placebo. The deceitful placebo proves the vast potential of the human brain to heal itself, essentially to create the antidote.